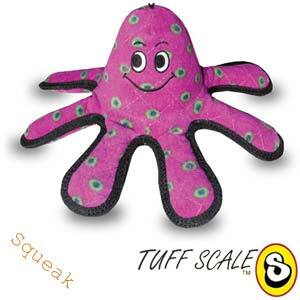 Probably the world's toughest 'soft' dog toy. 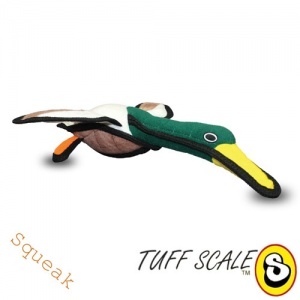 Each Tuffy is made using up to four layers of material, securely sewn together by up to four rows of clever cross stitching, all bound up in a protective binding. The ideal toy for even the toughest opponent. 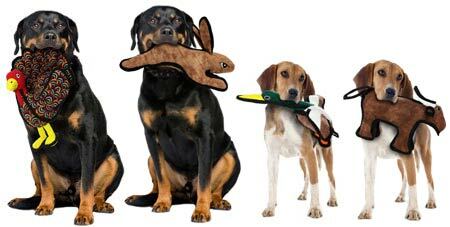 Your dog will be entertained for hours! 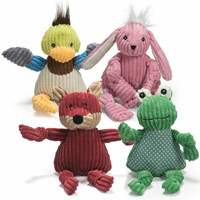 Choose from Oscar Octopus, Dudley Duck, Talulah Turkey, Larry Lobster or Brown Rabbit. 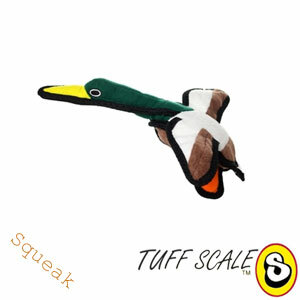 In addition to all that TUFFness, Tuffy toys float and some also squeak. 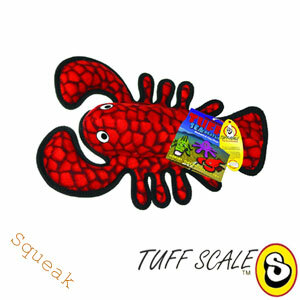 All squeakers are enveloped in a special protective pocket of material, should your dog get the squeaker out. 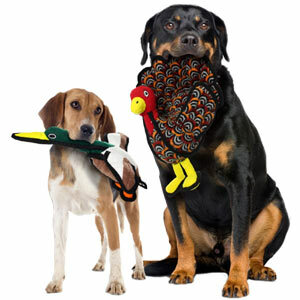 Each toy has an inner plastic coating layer followed by a layer of luggage grade material and finished with an outer layer of durable fleece. The inside is filled with a non-toxic fibre. The soft edges won't hurt your dog's gums. 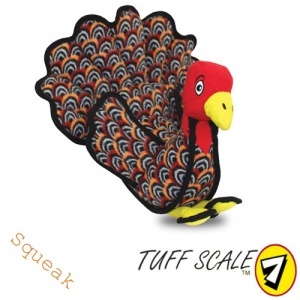 These fuzzy, tough little friends are great for fetch, tug and all sorts of games. 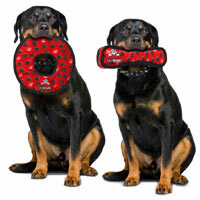 They can also help with boredom and destructive behaviours. Tuffy can be machine washed and hung to dry. Available in a range of colours, shapes and sizes. 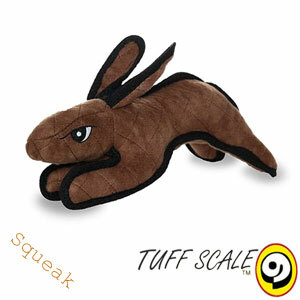 Brown Rabbit Small 1 9 Small/Medium 3" x 11" x 6"
Larry Lobster Multiple 8 Small/Medium 2" x 7" x 11"
Dudley Duck Small 1 8 Small/Medium 3" x 12" x 13"
Brown Rabbit Large 1 9 Medium/Large 5.5" x 13.5" x 9"
Oscar Octopus Multiple 8 Medium/Large 6" x 12" x 12"
Talulah Turkey Small Multiple 7 Medium/Large 10" x 13" x 7"
Dudley Duck Large 1 8 Medium/Large 5.5" x 14" x 16.5"
Talulah Turkey Large Multiple 7 Large 12" x 15.5" x 10"
Various sizes and tough ratings help you choose the right Tuffy for your dog. 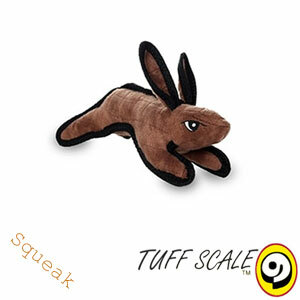 The tough scale runs from "1 - cheap plush toy" to "10 - mega strong". 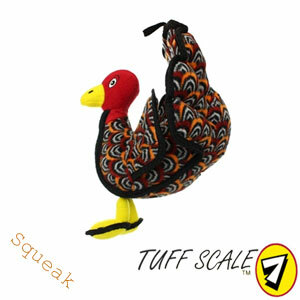 All Tuffy toys have a minimum rating of 5, so you can buy with confidence e.g. 7 is very tough, 8 is super tough and 9 is extremely tough. Tuffy toys are designed for play. No toy is 100% indestructible.